Scientists and students dive deep underground to connect with our evolutionary past. Winter in the South African Highveld paints with a palette of golds and reds, dusty browns and shades of pale pink. An arid grassland at once reminiscent of the American Midwest and Southwest, the landscape is dotted with striking clusters of green — trees growing along the slopes of the region’s undulating hills. Often, these trees betray a secret. Attracted by moisture, they grow atop a meshwork of underground caves that, millions of years ago, provided water, cover and shade to early peoples in a part of the world now called the Cradle of Humankind. An arid grassland is dotted with clustered stands of trees, fenced-off areas and warning signs marking openings to the below-ground Rising Star cave system, part of the Cradle of Humankind World Heritage Site near Johannesburg. “The origins of humankind, of humanity, is an African story,” says Travis Pickering, a professor of anthropology at the University of Wisconsin–Madison who has spent most of his career studying fossils in South Africa. His mission: unearthing the bones, stone tools and other clues that help tell the story of how we came to be. Located about 30 miles northwest of Johannesburg, the Cradle of Humankind stretches across 180 square miles. The area is rich in fossil-bearing caves, including Swartkrans, Sterkfontein and Rising Star. The Sterkfontein Caves are known for their vast holdings of early hominid fossils, some dating back 2.3 million years. Homo naledi was discovered in the Rising Star Cave, and in 2013, an international team of six women — including one from UW–Madison — worked to excavate the fossils. Some of the world’s most important archaeological and anthropological discoveries about the hominid family (which includes humans and their ancestors) have been made in or near the Cradle. These include the Taung Child, discovered in 1924; Mrs. Ples, discovered in 1947; Little Foot, found in 1997; and Homo naledi, unearthed in 2013. “Every one of these big discoveries is coming out of this tiny area,” says John Hawks, a professor of anthropology at UW–Madison who helped lead the excavations that culminated in the discovery and descriptions of Homo naledi, the newest human ancestor uncovered in the long and convoluted history of evolution. Unearthing these treasures takes persistence and skill. To recover Homo naledi, for instance, a team of archaeologists (including then UW–Madison graduate student Alia Gurtov) squeezed its way through underground passageways — some not much wider than a mailbox — and worked in near darkness to delicately remove the bones. “This kind of cave exploration is a difficult beast,” says Hawks. At Swartkrans, less than two miles from the cave where Homo naledi was found, Pickering runs a summer field school where UW–Madison undergraduate students meticulously search for new finds. “UW has a huge contribution to make in the study of human evolution,” says Pickering. The connection to the UW goes all the way back to 1946, when a South African zoologist named John Robinson apprenticed in the Cradle with the renowned paleontologist Robert Broom. While excavating across the road from Swartkrans at Sterkfontein Caves in 1947, Robinson and Broom discovered the nearly complete skull of the fossil now known as Mrs. Ples. Whole skulls are rare and Mrs. Ples, identified as Australopithecus africanus, helped convince the world that these creatures, dating back millions of years, were indeed our ancestors. 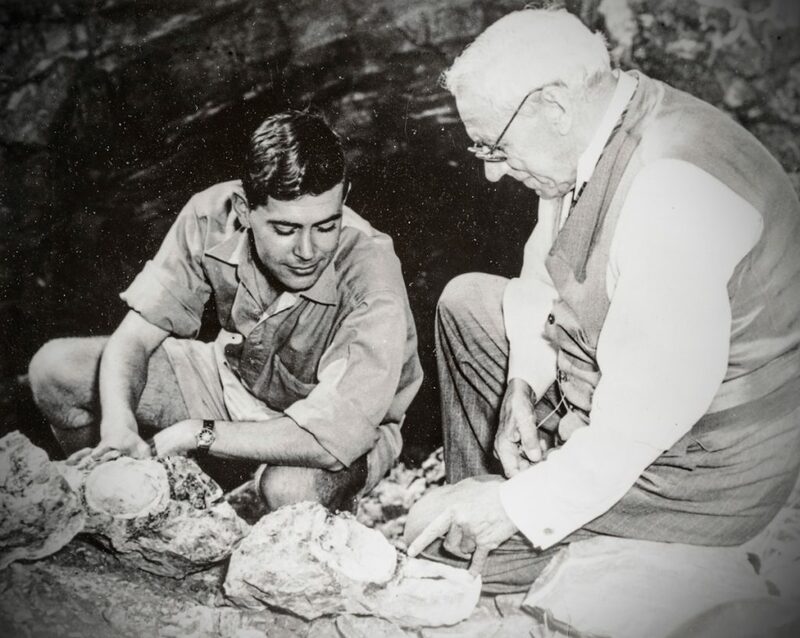 A young John Robinson (left) and paleontologist Robert Broom, circa 1948. Courtesy of the UW–Madison Zoological Museum. In the 1960s, rejecting South Africa’s system of racial oppression known as apartheid, Robinson packed his belongings and, with his wife and young sons, sailed across the Atlantic Ocean. His final destination: Madison, Wisconsin. It was during his time at UW–Madison, as a professor of anthropology and zoology and director of the Zoological Museum, that Robinson’s work led to a revolutionary discovery by a then up-and-coming scientist. It began with parts of a face and brain case, the upper-back part of the skull that protects the brain, that Robinson and Broom found at Swartkrans in 1949. They classified these, along with other hominid fossils, as Paranthropus robustus. Twenty years later, on his first visit to the Transvaal Museum in Pretoria, South Africa, a young British-trained scientist named Ronald J. Clarke, was inspecting the Swartkrans hominids when he noticed something unusual about these fragments: They did not match with Paranthropus. In fact, the skull fragments had features more like those of humans. When Clarke compared them to a piece of an upper jawbone that Robinson had identified in 1953 as early human, he found that they fit together. Perfectly. The fragments Broom and Robinson discovered in 1949 actually belonged to an early human from the genus Homo. Swartkrans was already well-known for its abundance of Paranthropus robustus specimens. But nowhere in the world had anyone before discovered Homo living with them in the same place at roughly the same time. Clarke’s discovery changed the course of scientific understanding of human evolution. Today, Ron Clarke is a professor in the Evolutionary Studies Institute at the University of the Witwatersrand (“Wits” for short) in Johannesburg and one of Travis Pickering’s closest collaborators. They have worked with a team to analyze and describe Little Foot, the most complete Australopithecus skeleton ever found. Dated to be 3.67 million years old, she has been named Australopithecus prometheus. Discovered serendipitously in 1997 by Clarke and two assistants, Stephen Motsumi and Nkwane Molefe, Little Foot was meticulously excavated over the course of two decades from the concrete-like rock called breccia that makes up most South African anthropological sites. Pickering got involved three years ago, contributing his expertise in taphonomy — what happens to bones after death. 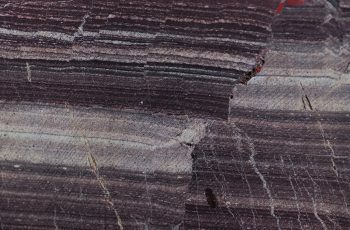 Fossils in South Africa are often encased in a hard, concrete-like rock called breccia. Fossil experts, like Abel Molepolle here, use specialized tools to delicately remove the fragile bone from this rock, a process that can take years or even decades. A cast replica of the most complete Australopithecus skeleton known — a hominid named Little Foot — is pictured in a workshop at Sterkfontein Cave. The fact that she is nearly complete, unlike other famous finds like the Australopithecus Lucy, allows scientists to build a more thorough picture of what Little Foot and others looked like. They can study characteristics such as limb length and stature, and such a complete skeleton acts like a sort of template for comparing known species against more fragmentary fossils. “Little Foot allows us to create a fully formed story of the anatomy of these animals as a genus,” says Pickering. As the warm midday sun begins to chase away the morning’s chill from the Swartkrans field school site, a group of students huddles over sifting screens to sort artifacts. The name Swartkrans is Afrikaans (one of South Africa’s 11 official languages) for “black cliff” and the anthropological site is marked by two open pits. One contains material dating back more than 2.3 million years and the other holds artifacts going back as recently as 110,000 years ago, the era of modern humans. There is also a subterranean area with additional deposits, including the first evidence of deliberate use of fire. The study of human origins involves a good deal of geology, paleontology, chemistry, zoology and more. Swartkrans, located in the Cradle of Humankind World Heritage Site near Johannesburg, is among the most important archaeological and anthropological sites in the world. Nearly every summer, UW students excavate for fossils and artifacts during an archaeology field school there, led by anthropology professor Travis Pickering. Pickering climbs down into an enclosed area at Swartkrans. The site was the first to show that different early human ancestors coexisted. Swartkrans has produced hundreds of early human fossils, along with the first evidence for controlled use of fire and the first use of non-stone tools. Beams hold up some areas of the cave that have become less stable with excavation. At one sifting screen, Wits professor Kathleen Kuman, considered one of the world’s preeminent early-human archaeologists, sorts animal bones and flakes of stone left over from stone tools produced as long as 2.6 million years ago. At the other, Wits field assistant Andrew Moyagabo Phaswana sorts larger materials with the help of a student. Bags and trays full of artifacts and fossils lie in the sun off to one side. Local people like Phaswana often spend decades working with scientists like Pickering and Clarke, lending their valuable expertise and knowledge of the region. Eight students from UW–Madison, along with Recognise Sambo, a South African graduate student, excavate material from the two pits. They haul it to the screens for sorting; later, the material will undergo laboratory analysis. Field assistant Andrew Moyagabo Phaswana and UW–Madison student Emmaleigh Grady use a sifting screen to sort for fossils and artifacts. UW–Madison student Talia Sankari searches for fossils and artifacts. Wits graduate student Recognise Sambo is poised to become one of the first black female anthropologists in South Africa. Wits postdoctoral researcher Matthew Caruana points out the hammered edges of a Middle Stone Age point. “These students are the future,” says Kuman. For some, field school becomes a critical part of a career and inspires an entirely new way of thinking. Swartkrans is helping scientists learn not just what early humans looked like but also how they lived. This is due largely to efforts by UW students. Pickering introduces the field school students to hominid fossils. Sankari looks at hominid fossils housed at the "bone vault" (more formally known as the Phillip V. Tobias Fossil Primate and Hominid Laboratory) at the University of the Witwatersrand in Johannesburg. At Swartkrans, our ancestors had to learn how to defend themselves against large cats, hyenas, and other primates. They created crude weapons and tools and refined them over millions of years. They learned how to control fire. These technological advances are also reflected in the fossil record during this period (the Stone Age), Kuman says. Innovations are linked to increases in brain capacity and changes in diet. “This must certainly have required an extended period of juvenile development in our ancestors,” Kuman says. Young people took longer to grow up and this allowed for more sophisticated tool making. As researchers fit together more pieces of the evolutionary puzzle, it becomes clear that our conception of evolution as a simple pathway where one species evolves into another simply isn’t true, says UW–Madison anthropology professor John Hawks. He envisions humanity’s origins more like a river delta, with waterways weaving in and out of a channel that radiates outward. That model can explain why a small-brained ancestor like Homo naledi might have existed at the same time as Homo sapiens. It’s why Paranthropus robustus may have competed with Homo habilis for food, space and shelter. “The exciting thing is, we’re charting this course through unknown territory and we have the privilege of knowing there is more to discover,” Hawks says. Hawks is also dedicated to sharing this knowledge with the public in new ways. For most of the history of anthropology, excavations were conducted by small teams and analysis was performed by a select group of highly qualified scientists. While the finds themselves would make headlines, the implications of discoveries would often take years to see the light of day, and then often only in obscure academic publications and talks. 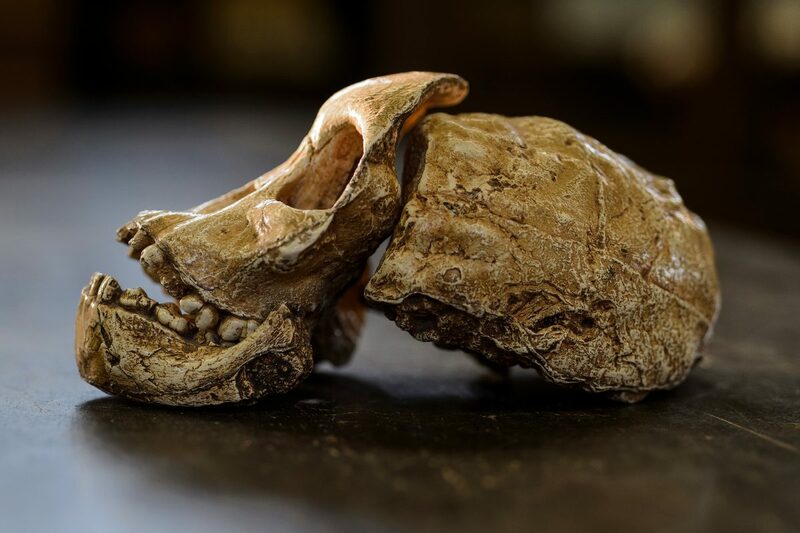 Hawks and his co-scientific lead on the Homo naledi project, Wits anthropology professor Lee Berger, have turned this approach on its head, greatly expanding the number of scientists on their research teams and sharing information publicly at early stages. More than 100 people were initially involved in recovering, analyzing, cataloging and making Homo naledi’s data accessible to other scientists. Their fieldwork is kept brief and efficient. Scans of the bones are made public so others can study them virtually or 3-D print them. Hawks routinely shares findings from the field on social media and teaches undergraduate courses to UW–Madison students virtually, giving lectures from cave entrances and other unique anthropological sites. Today, Homo naledi is on display at Maropeng, a museum in the Cradle of Humankind dedicated to human origins. The exhibit is designed like a cave, taking visitors through “chambers” where they learn how naledi was discovered, the teamwork involved in its study and the fossil’s place in the evolutionary story. The final chamber brings visitors to a room where Homo naledi rests in a special protective case. Hawks appears in a documentary playing in the exhibit and occasionally visits in person. As a family toured the museum one day, they entered the final chamber and were greeted by the very scientist they had observed on screen moments earlier. Before long, Hawks was surrounded by a crowd peppering him with questions about these ancient humans: How old are they? What other animals were around when they lived? Did Homo naledi get cavities? Visitors walk to and from the earth-covered Maropeng museum, part of the Cradle of Humankind World Heritage Site near Johannesburg. Replica skulls of Homo naledi on display at the Maropeng museum. Standing deep in the earth at Swartkrans, there is something indescribable about being in the place that harbors the mysteries of the people who came before us, united by a common ancestor some 7 million years ago. 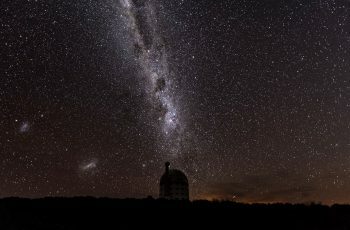 There is something profound about tracing the history of our species, condensing millions of years of physical, social and intellectual developments that have led us to the present moment — a moment when scientists have the power to unravel the mysteries of the universe we inhabit and the planet beneath our feet. In South Africa, that fellowship can appear in unexpected and powerful ways. At the Apartheid Museum in Johannesburg, there is a small alcove just past the entrance. In it hangs a portrait of Mrs. Ples, the pivotal fossil skull discovered seven decades ago by John Robinson and Robert Broom. The inscription states the great truth uncovered by the anthropologists who have endeavored to tell the human story.